Comes with a 5x24 finder scope, three 1.25" diameter American standard professional sized eyepieces. The sturdy altazimuth mount with a vertical slow motion control and lock, is easy to move in any direction. The strong tripod is made from extruded closed channel aluminium. I don't care how cheap this is, and it's not that cheap for a very poor specification. Being a reflector it's troublesome to use for terrestrial work. It's too small for astronomical use and the mount will be nothing but trouble. If you want to see the planets don't buy anything smaller than a 5" reflector or a 3" refractor and always buy an equatorial mount. Normally I'm all for cheap and cheerful stuff (even if it's not quite as good as it's high spec counterparts), but I'll agree here - at this price you'll find it very frustrating and disappointing (as it just won't be sturdy/stable enough to track objects, at best you'll see a blurred wobbling light). As many others have said, good binoculars are often better than cheap telescopes. 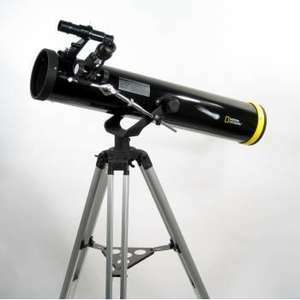 Price wise, I bought a telescope of similar spec to this for £30 delivered from Argos at the end of last year (and I wish I'd bought a better specification one, although at the price I feel I can justabout scrape enough enjoyment from it). who said that the intended use was to look at celestial bodies. It may be perfect for observing bodies of a different type closer to home. who said that the intended use was to look at celestial bodies. It may be … who said that the intended use was to look at celestial bodies. It may be perfect for observing bodies of a different type closer to home. Whenever a telescope is advertised by its maximum power, it is crap. Proper telescopes always have the aperture given as the main specification.